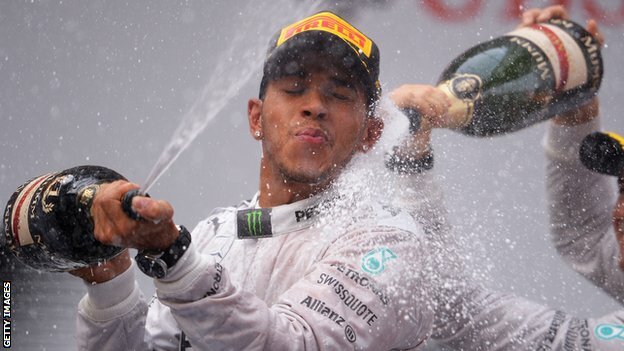 Formula One: Hamilton conquers China after securing hat-trick! 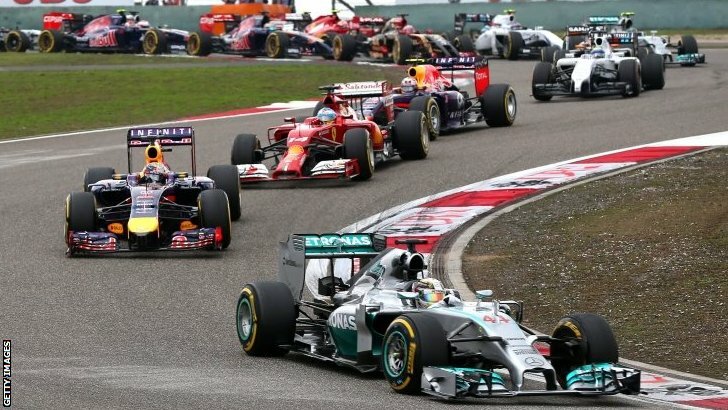 Home » Formula One: Hamilton conquers China after securing hat-trick! Lewis Hamilton has taken his 3rd win of the season after winning today’s Chinese Grand Prix at the Shanghai International Circuit. Nico Rosberg completed yet another Mercedes 1-2 finish after a difficult race where he started 4th and fought with no telemetry to finish a few seconds ahead of third placed Fernando Alonso, who secured Ferrari’s first podium of the year. Hamilton started the race as he meant to go on, with a great launch from his grid slot on the run to turn 1. Team-mate Rosberg had less of a great start from P4 on the grid after a mistake in qualifying yesterday. He made contact with the fast starting Valtteri Bottas into turn 1 and fell down to 7th by the end of the lap. Valtteri’s team-mate was also in the wars after making an excellent getaway. Felipe launched his car from P6 to be side-by-side with Alonso on the run to turn 1, but the gap soon filled itself with Massa making contact with his ex team-mates rear. The Brazilian then edged back down to 6th after the contact. Despite the contact with Massa, Alonso managed to hold onto his good pace and held 3rd place at the end of lap 1 behind Sebastian Vettel. Ricciardo was just behind, with the Red Bull’s having traded track position into turn 1. With Lewis already holding a 2.4 second lead by the end of lap 2, it was time for Rosberg to start clawing his way back up the field. He first passed Nico Hulkenburg’s Force India, followed by Felipe Massa’s Williams down into turn 14. The first pit-stops began early on lap 10, with Massa being one of the first to pit with former team-mate Raikkonen. It was a disastrous start for the Brazilian, with the Williams mechanics struggling to remove the old rear-left, with the contact at turn 1 possibly being at fault. The pit-stop was long and frustrating, with the Brazilian lifting his visor and waving in frustration. He eventually re-joined in last place. Following the pit-stops, Rosberg started hunting down Sebastian Vettel for 3rd, with the reigning champion having lost 2nd to Alonso during the pit-stops. Nico managed to get by Vettel down into turn 1, with Vettel now having to worry about team-mate Ricciardo who was catching up. Vettel may have wanted to keep the position ahead of his team-mate, but Ricciardo was having none of it, with the Aussie making the move at turn 1, with Seb seemingly realising the pointlessness of contending the issue. The frustration continued for the German later on, when Kamui Kobayashi un-lapped himself with the faster tyre fitted to his Caterham. The Red Bull was then held up by Kamui, with Vettel pitting soon after to get some clear air; despite the fact that he re-joined behind Kamui’s team-mate Marcus Ericsson. Vettel’s fellow countryman Rosberg was continuing his charge through the field and was getting ever closer to the back of Fernando Alonso for 2nd. Despite setting his best lap times in the closing stages of the race, Alonso could not hold back Rosberg, who took the position with the aid of DRS on lap 41 out of 56. Alonso’s focus remains rearward however as he now sought to keep his podium position from Ricciardo’s Red Bull, who was beginning to close in. Riccardo gave it everything and claimed after the race that given a few more laps he could have taken the podium spot, but Alonso managed to do just enough to keep his position. Rosberg may have gotten through on Alonso earlier on, but the overtake had not allowed Nico to make a dent on his team-mates lead, with Lewis Hamilton crossing the line on the final lap to win by 17 seconds ahead of the sister Silver Arrow. 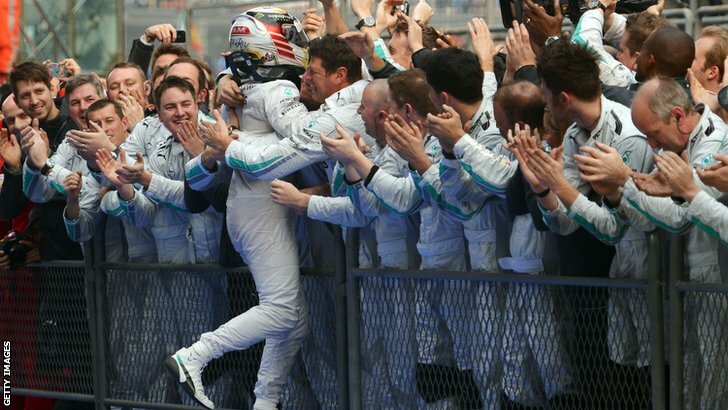 The win for Lewis means that the Brit now has 25 career victories, equalling the amount held by Jim Clark and Mercedes management member Niki Lauda. Rosberg completed the 1-2 finish for the team for the third time this season and subsequently held on to his championship lead; albeit by a mere 4 points. Despite only being 4 races into the season, Nico has now led the driver’s championship for more time than his father, 1982 F1 champion Keke, ever did. Fernando Alonso, as mentioned earlier, managed to hold Ricciardo back to take his first podium of the season at the circuit where he claimed the win last season. Ferrari will be hoping that the podium marks an upturn in the Scuderia’s fortunes after a tough start to the season. 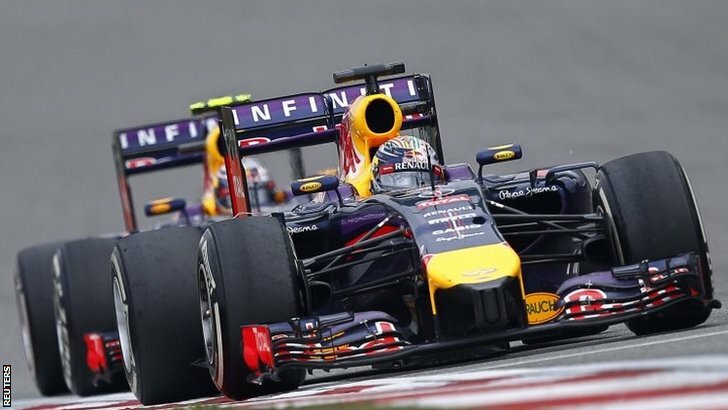 The two Red Bull cars came home 4th and 5th, with Ricciardo 20 seconds ahead of Vettel. Nico Hulkenburg took 6th place for Force India after just holding off a late charge by the 77 car of Valtteri Bottas. Fellow Finn Kimi Raikkonen took 8th ahead of Bahrain podium finisher Sergio Perez. Russian rookie Daniil Kvyat took his 3rd points finish in his 4 race career in 10th place, once again beating team-mate Jean-Eric Vergne who came home in 12th. The two McLaren cars of Button and Magnussen finished outside of the points after a downturn in performance, with Maldonado coming through the field from last on the grid to take 14th in the #13 Lotus. Massa came home in a disappointing 15th after his early race calamities, with Gutierrez behind him in the Sauber. The Marussia and Caterham cars rounded out the classified finishers, with Kobayashi and Bianchi duelling down to the last lap for 17th and 18th place. Only two cars failed to finish the race, a stark contrast to the number predicted to retire in the early races of the season. Romain Grosjean’s promising top 10 qualifying result was let down by mechanical problems during the race, with the Frenchman losing 4th gear before the team elected to retire the car. Adrian Sutil retired early on in the Sauber, completing a hat-trick of retirements in a hugely disappointing start to the season. Fernando Alonso, 3rd place: “It was a good weekend we did improve the car a bit and to be on the podium is a nice surprise for us. I think I am third in the Drivers Championship behind Nico Rosberg and Lewis Hamilton and we didn’t have the start to the season we wanted so to be here is fantastic.